our two-day trans-Atlantic Antitrust Dialogue in May 2005. Areas covered include in-depth analyses of such topical issues as cartels, pricing practices and mergers, and provide comparative perspectives from European and North American experts, as well as important statements of policy by competition officials. Of the first volume in this series, Competition Law Yearbook 2002: 'The quality of the speakers and their talks is comparable with those of the Fordham Corporate Law Institute. Many experts are in the audience and the discussions after the talks are also perceptive.' 'This newcomer to publications on competition law and policy is warmly welcome.' (Valentine Korah, Professor Emeritus of Competition Law, University College London). The full price for this book when not purchased via the website is: Members £60 Non-Members £100. 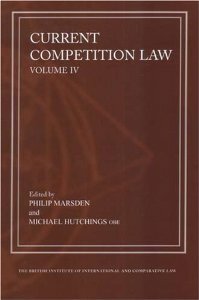 "Current Competition Law Vol. IV"